Blogging is a world-famous term which make people write articles on a blog and share on the social network and social bookmarking sites and make money. But we see that sometimes bloggers fail to be successful in Blogging. We all need a driving force to push a blogger to the next level of success. I call it Passion Blogging or Passionate Blogging. In the beginning, blogging is full of hard-work, pressure, and challenges. Many bloggers agree with my idea. In starting days bloggers don`t make money with any advertisement program. Passion is one of the most critical factors to help a blogger drive forward without thinking about money. Today, we will discuss passion blogging or passionate blogging and factors that make me a passionate blogger. If you are a passionate blogger, then you must have these in you also. What Makes Blogging My Passions? In the beginning days of blogging, I was not aware of many things like a blogging platform, SEO, basics of writing and social network benefits. I made mistakes and learn from my mistakes. 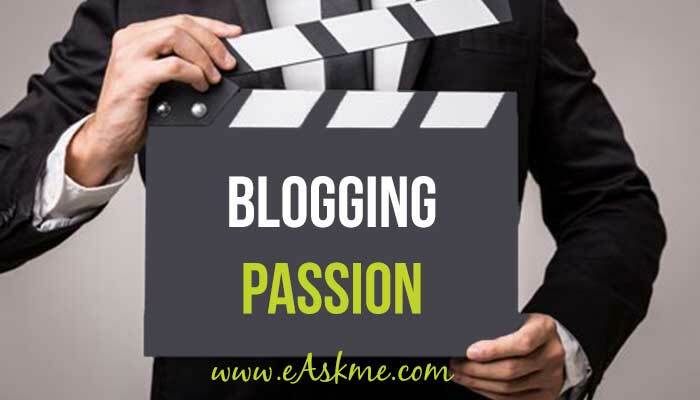 Since the start of the eAskme blogging network, every day I discover new things, and my passion for learning new things makes me a passionate blogger. See : Why Blogging Is The Best Online Money Making Business? We all see ups and downs in life. But when I work on my blog, I am a different person. I do not feel any worries, and my passion drives me to work. I like interacting with my blogging friends and partners. I don`t like to spend days without blogging. You can say I am addicted to blogging. Because blogging is my passion. I learned a lot with my passionate blogging habit. It also took time, but I love investing my time in blogging. I learn new things and share my articles. Passion is that we give time to blogging and make it our first preference. Work late nights and never feel tired; that is how passion drives you. We all know that we want money from our work. When I talk about blogging, I feel money as a secondary part. My priority is always to improve myself as professional blogger. If you are a passionate blogger, then you need not to worry about money, as in Blogging, your passion drives heaps of money for you. Blogging takes time because it is not just about writing posts, but it also includes SEO, Traffic, Social presence. If I talk about me, Blogging is my full-time professional career. To be successful, I never go for any unethical way. When we talk about passion blogging, it`s about working hard and also ethically smart. These are a few critical factors that every passionate blogger have to make blogging his/her career. Blogging takes time because it is not just about writing posts but it also includes SEO, Traffic, Social presence. If I talk about me, Blogging is my full time professional career. To be successful I never go for any unethical way. These are few important factors that every passionate blogger have to make blogging his/her career.